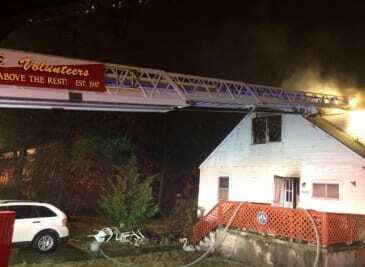 Crews battled a house fire in Parkville late on Saturday night. At about 11 p.m., units from the Providence Volunteer Fire Company, Lutherville Volunteer Fire Company, and White Marsh Volunteer Fire Company responded to the 8600 block of Ellen Court (21234). At the scene, crews found heavy fire showing from the rear of the home. The fire was brought under control at just before 1 a.m.